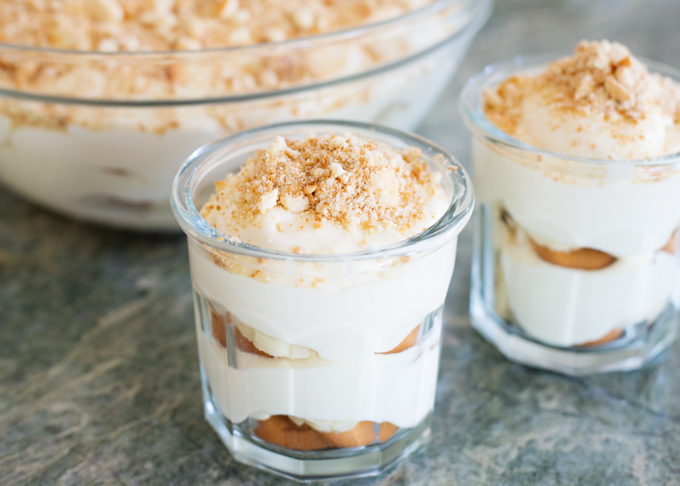 There’s nothing like a serving of old fashioned Banana Pudding! It really is quite old fashioned with the ingredients: pudding, vanilla wafers, bananas. So simple, yet so delicious! 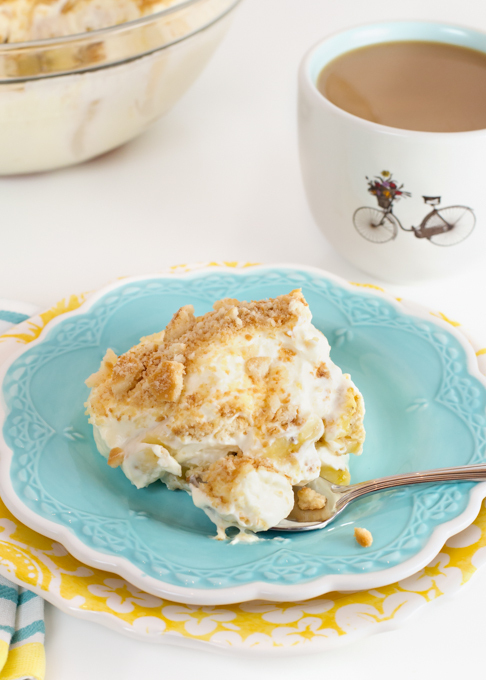 Can’t you just picture your grandmother making a bowl of Banana Pudding for dessert? 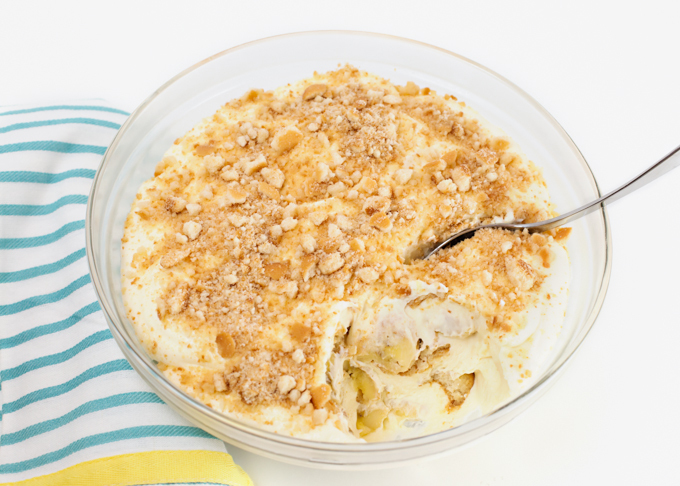 I don’t know know if my grandmother actually ever made Banana Pudding, but just saying that gave me a visual of my grandmother, in the kitchen, wearing her floral apron. She always wore an apron! It really is one of my most vivid memories of her. I wear an apron, maybe a dozen times a year; when I cook a holiday meal, when my grand babies are here and we’re cooking together (because aprons are fun! ), and when I whip whipped cream (that was today!). It just seems to splatter everywhere!! Have you ever visited Magnolia Bakery in NYC? Their cupcakes are delicious (especially their coconut cupcake), but if you’re a fan of Banana Pudding, this is the place to get it. Or, you can make mine, because the recipe came straight out of their cookbook!! Our youngest daughter lived in NY for a couple of years, and you can bet that anytime we went for a visit, we went to Magnolia (for cupcakes and pudding), because when you’re in NY, you eat. And you eat a lot! And you walk. And then you eat some more! Breakfast, lunch, dinner, and about twelve snacks in between. Because, it’s NY. And it’s what you do! 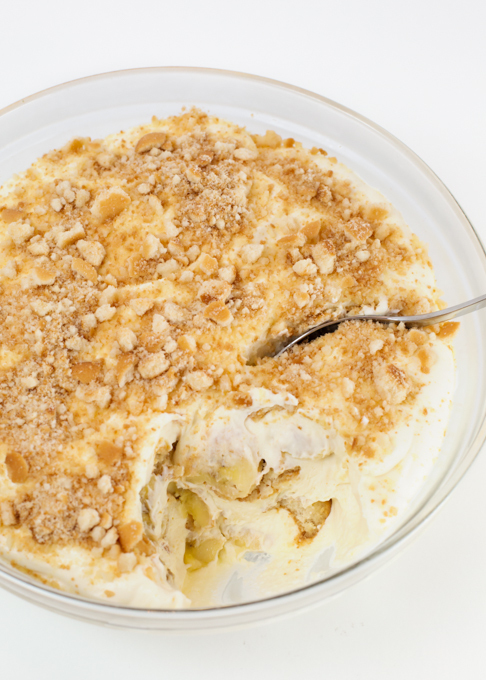 Banana Pudding is quite simple to make, although it needs to refrigerate between steps, so don’t plan this afternoon to make it for tonight’s dessert. I actually made the whipped cream mixture the evening before, covered it well with plastic wrap, then the following morning, made the pudding mix and assembled the Banana Pudding. I didn’t have the perfect bowl, it really should have been in a straight sided clear glass bowl. You can see the the side of my bowl had rounded sides. It worked fine, but it’s hard to get the presentation of the layers to show. It certainly didn’t affect the taste! My husband and I had no problem digging into the large bowl! Sharing is caring! 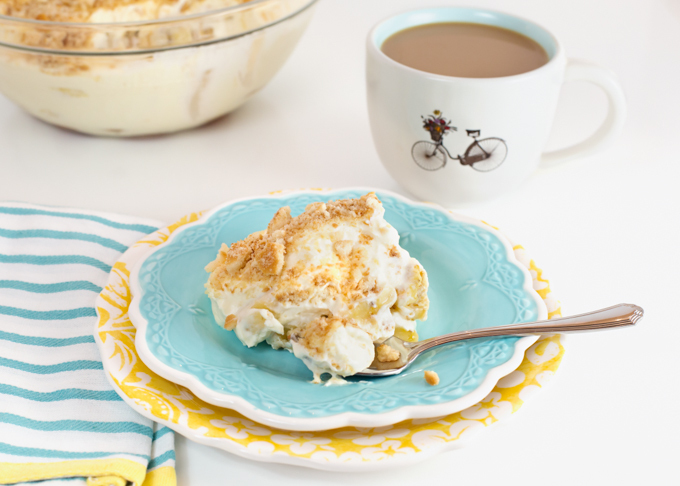 Your banana pudding friends would be happy if you shared this recipe with them via FB, Pinterest, or Twitter! In a small bowl, beat together, using med speed on hand mixer, the sweetened condensed milk and water until well combined (about 1 minute). Add the pudding mix and mix well (about 2 minutes more). Cover and refrigerate for 3-4 hours or overnight. In a large bowl, on med. speed of hand mixer, whip the heavy cream until stiff peaks form. Gently fold the pudding mixture into the whipped cream until well blended. Use a large clear glass bowl with a 4-5 qt capacity. 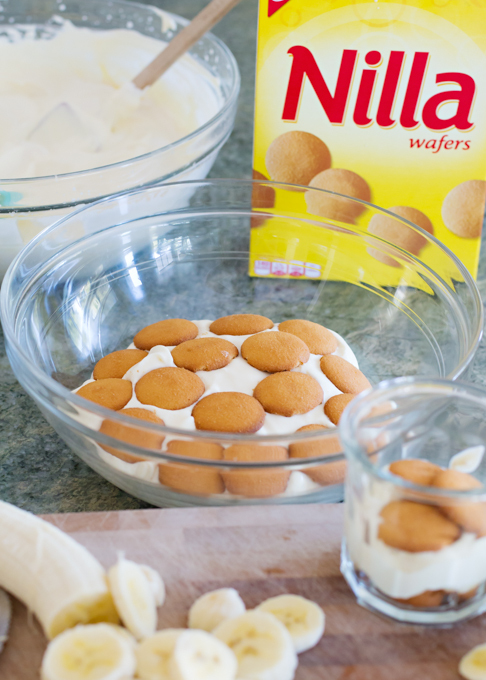 Arrange ⅓ of the wafer cookies to cover the bottom of the bowl, then layer bananas, then pudding. Repeat the layering two more times, ending with pudding. 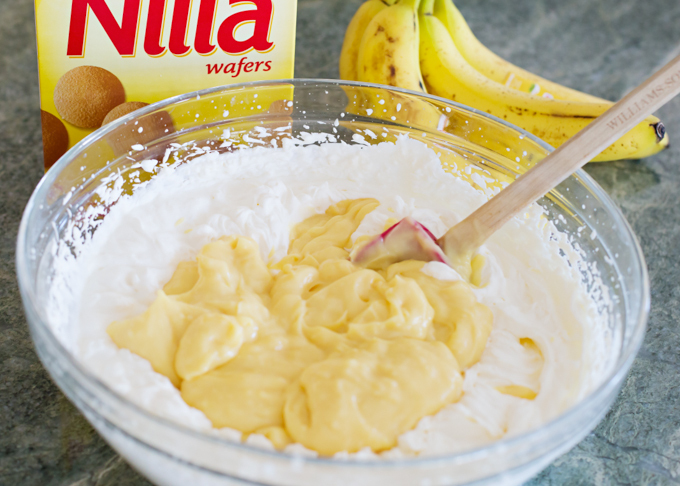 Crush a few wafer cookies and sprinkle on top. Cover with plastic wrap and refrigerate for 4-8 hours (no longer). 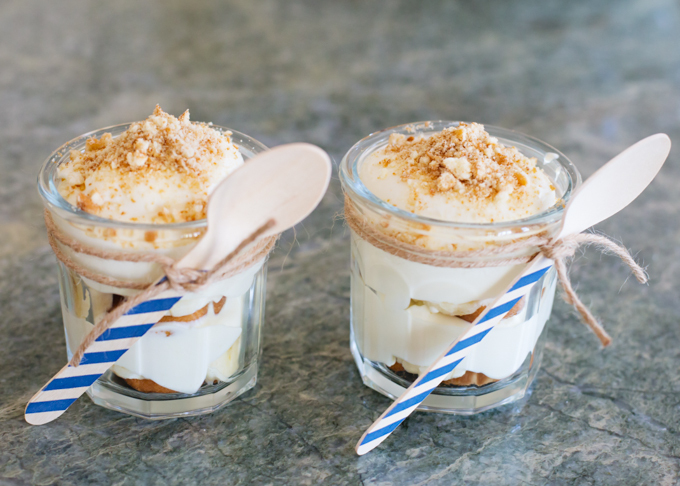 This is a great dress-up recipe for pudding. I like the fact that this could be a gluten free dessert if you used a gluten free cookie instead of the vanilla wafers. I bet it would taste yummy with gluten free gingersnaps even. Amazing! Not very many will crumble a cookie on the top! It makes even better. I haven’t had banana pudding in years. Time to get back into the kitchen and see if I can whip this up so I can enjoy and old family classic.